Mobile messaging service Line is continuing to grow its revenues at an impressive rate, after the company revealed that revenue generated during its first quarter of 2014 period reached 14.6 billion yen, around $143 million. 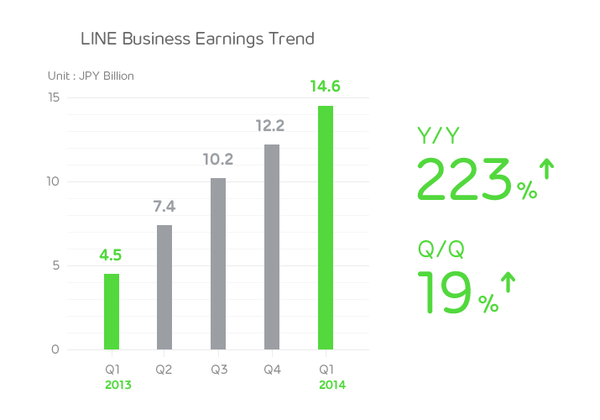 Line doesn’t reveal net profit/loss, but it’s interesting to note that its growth is outstripping that of Twitter. The Japanese company’s revenues have increased 223 percent over the past year and 19 percent over the past three months alone — while Twitter’s most recent quarterly revenue is higher ($250 million), the company’s growth totaled 119 percent year-on-year and was up just 3.2 percent quarter-on-quarter. Aside from the fact that both companies are focused on mobile, Line (and others like it) are interesting because their business is based around private messaging, a feature that Twitter has offered since it started in 2006 but is only just getting round to focusing on. Until it made updates last year, Direct Messages (DM) were a pretty hidden feature in Twitter’s mobile apps and website. There’s even a suggestion that the feature was nearly killed off as Twitter focused its efforts on monetizing its timeline through advertising. So the fact that younger companies (Line started in 2011) can sprout up and grow at a phenomenal rate, suggests that Twitter may have missed out on that side of its business. Line has over 420 million registered users. It makes more than half of its revenue through in-app purchases within the 30-plus games that are connected to its messaging app, those games have been downloaded over 300 million times. This time around the company isn’t specifying how much came from games, but it has typically been around 60 percent of its revenue in the past. Line isn’t the only one making serious cash from gaming, Kakao Talk in Korea is already profitable thanks to games, and its titles dominate domestic app stores. Line also offers a marketing platform for companies, which pay to have accounts that users can opt in to follow for messages, news and promotions. They can also offer branded stickers, which users download for free on the condition that they follow the company’s Line account. As we showed last year, Line advertising can be more effective than Twitter, since it delivers push messages to users without the noise of a timeline. The mechanics of the platform have also enabled some brand accounts, such as Paul McCartney’s, to have more many fans on Line than followers on Twitter. Lately, Line has taken the marketing model further and it is piloting flash sales through the app too. That’s something Tencent’s WeChat app is also doing in China. Finally Line also sells stickers, although they account for a smaller segment of its revenues than many people realize. Nonetheless, selling over $10 million-worth of stickers per month is quite a feat. Could Twitter embrace any of these revenue models or services? Certainly. The first start would be a standalone DM app, something that has been rumored for some time. While there is no figure for the losses that Line is almost certainly incurring due to its spending on global marketing and advertising campaigns, its new financial figures are a timely reminder of how Twitter could develop its business. That’s particularly pertinent right now, a time when Twitter’s share price has plummeted after the lock-up period expired.